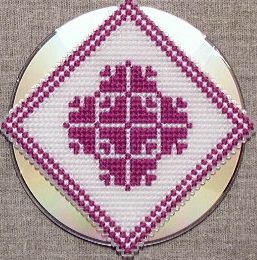 Transform a CD with Cross Stitch. Photo © Connie G. Barwick, licensed to About.com, Inc.
Once you finish a cross stitch pattern what do you plan to do with it? Sure you can frame it, but maybe your walls are too full and you are looking for other ways to show off your work. Below is a sampling of what you can do with your cross stitch once it is finished. Keep a record of all your adventures in Cross Stitching. Enjoy your favorite beverage while protecting your furniture in style. Stitch up some Cross Stitch bling. Create a simple bookmark with a small piece of Aida and a stitched design. Use a bookmark or piece of Cross Stitch Ribband to make a simple card. Add acid-free paper embellishments to a design stitched on fabric, perforated paper, or plastic canvas for a unique card. Make a simple and easy card by affixing a small stitched design to a blank card. Use a photo-frame card to quickly create a creative Cross Stitch Card. Ideas for dressing up a simple photo frame Cross Stitch Card. This project makes a great gift box or storage box for supplies. Start with a simple wooden or paper box. Add a stitched project and some trim. Use a stitched or beaded design to make an elegant gift tag by borrowing a paper frame from the scrapbook supply aisle. Stitch a pattern on plastic canvas for a quick pin. Don't toss out damaged or unwanted CDs. Rescue them instead with this project.